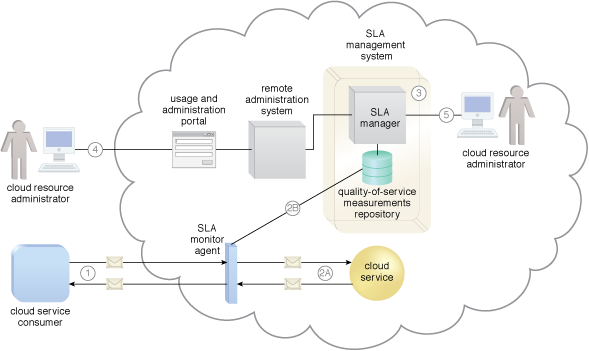 Figure 1 – The SLA monitor polls the cloud service by sending over polling request messages (MREQ1 to MREQN). The monitor receives polling response messages (M to M ) that report that the service was “up” at each polling cycle (1a). The SLA monitor stores the “up” time—time period of all polling cycles 1 to N—in the log database (1b). The SLA monitor polls the cloud service that sends polling request messages (M to M ). Polling response messages are not received (2a). The response messages continue to time out, so the SLA monitor stores the “down” time—time period of all polling cycles N+1 to N+M—in the log database (2b). The SLA monitor sends a polling request message (M ) and receives the polling response message (M ) (3a). The SLA monitor stores the “up” time in the log database (3b).